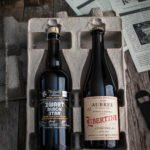 A beer subscription for The Rare Beer Club® is nothing short of signing up for a monthly taste of some of the best and most unique beers in the world. Hand picked, artisanal masterpieces and often times exclusive single-batch releases. The kind of beers that dreams are made of, beers that propel people on veritable journeys of discovery and pure indulgence. These are brews that can expand your horizons, beers you can revere, beers you can age and save for special occasions. Beers that are very close to the craft beering equivalent of paradise. We are not, not in the least, exaggerating. 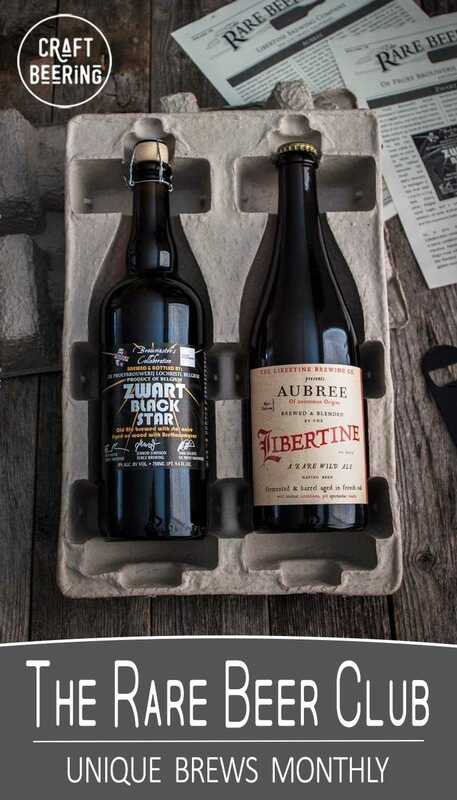 And as far as craft beer inspired gifts go – this beer subscription is on the top of our list. Before I delve into the tantalizing details of The Rare Beer Club® and try to convince you that it’s a great gift to give to oneself or others enchanted by craft beer, let me direct your attention to the label of the bottle in focus in the picture above. It has a message. It can easily be used as the ‘poster child’ for the selections you may expect from this beer subscription. “A rye saison of uncommon origins, …blended, …rare, wild ale,…fermented and aged in French oak, …unclear intentions, yet spectacular results” I mean…pure craft beering magic. Joining the ranks of The Rare Beer Club® members is like retaining your own personal cicerone whose singular goal is to surprise and delight you with hand picked incredible beers. Someone who faithfully researches, locates, tastes, reserves and carefully packages and ships you the crème de la crème of craft beer. Every month. Which is, in reality, exactly what happens. This beer of the month club was founded by no other than Michael Jackson, the late world famous craft beer expert and the father of the modern craft beer classification system. It is now part of the Microbrewed Beer of the Month Club family. When the folks who run the club make the claim that the club is all about rare beers they really mean it. Not only are the selections meticulously chosen among the most inventive and hard to come by brews, but they are sourced from inner circle, small-batch releases and are often shipped to members of the club earlier than they are released for sale to regular outlets. And sometimes, based on the relationships the club has with breweries, beers are crafted exclusively for its members. Those are rare beers in the truest sense of the word. Craft beer is very much about creating unique and unforgettable flavors with ingredients of the highest quality. It is very much about what is possible and the passion and resourcefulness to achieve the most imaginative of libations. This is precisely what you will be tasting once you subscribe to The Rare Beer Club® or buy a beer subscription for someone you really want to give an uncommon gift to. You or your intended gift recipient become privy to the real life embodiment of what used to be exciting possibilities and their ensuant delights. Expertly chosen, difficult to find beer styles delivered to your doorstep. The way you or your beer subscription gift recipient will be taken care of as a member of the The Rare Beer Club® is beautifully simple. Upon joining a member is allocated two (or more, see below for pricing and flex choices) bottles of the uniquely crafted brews the experts at the club have selected and negotiated for that specific month. All beers are 750 ml bottles. Beers are shipped in protective packaging. Beers are shipped via courier directly to the recipient’s home or business address with an adult signature required provision. Beers arrive with a plethora of enjoyment enhancing tips (see below). A personalized shipment program known as PSP for short is available (see below). We have never encountered a richer program. This is how the The Rare Beer Club® selection process is organized. A panel of highly experienced, completely craft beer obsessed devotees (just another way of saying experts) does the selection work. In their search for options to include in the beer subscription repertoire they taste hundreds of potential brews each year and leverage their knowledge to select only the best ones. Their travels routinely take them to craft beer judging events, breweries all over the country and the world and entails cultivating relationships with brewers and importers. Hence, the opportunities for exclusive beers brewed for the club members only. They also focus on seasonal beer styles, historically brewed around a certain time of the year and secure small production batches that ship just when the time for the style is ripe. Talking about attention to detail. Besides the impressive brews themselves a beer subscription to The Rare Beer Club® has another facet that Chris and I find appealing. It is the expertly curated information about each beer shipped. Sure, many beer clubs send a page with information about what is in their shipment…But it is really about the quality of the included content and its usefulness. The expertly written, succinct, yet very pertinent information sent by the curators of the club has the same level of class as the beer selections and literally adds value to the members’ experience with the beers. It is like an ongoing educational program combined with a trend setting service. By that I mean you are frequently being offered brews so creative that they are actually setting trends for other breweries to follow. Because the club’s selections curators are so in touch with the leading master brewers world wide they are aware of new beers and beer collaborations between brewers from their inception stages. The quality of the included information really takes placing a unique beer in your hands to the next level. You are advised about what you could do to achieve the best tasting experience. The expert tips included range from serving temperature and glassware selection for each beer to how it develops over time, whether or not you should age it and what to expect if you do age it. There are also food pairing tips (with an underlying why) and a lot of information on how exactly the beer was made. So as you taste you can delight in learning about which souring agent contributed to which flavor, how the balance between the Brett funk and the spices used was achieved and soooo much more. Chris and I have been members of all kinds of clubs throughout our lives, trying to taste and experience as much as possible and as much as we are comfortable with financially. From coffee, wine and cheese to (ongoing) craft beer subscriptions. In result we have seen how many different clubs operate and whether they offer bonus options such as to reorder items that were especially enjoyed or à la carte choices such as pausing shipments while traveling for extended periods of time. Considering the fact that highly coveted specialty beers are in question at The Rare Beer Club® the options available to club members offer unparalleled flexibility. The Personalized Shipment Program of the club addresses each and every possible detail and then some. Members are notified prior to each months shipment about the new beers featured and about to be shipped. Based on that information, members can add more bottles of each selection or request double the count of one selection while giving up the other. They can skip the entire shipment for that month altogether or request that it be sent to a different address that month only. They can also request beers (if still available) from past selections in lieu of the current month’s featured ones or in addition to them. They can take advantage of ultra exclusive beer options that comprise batches not large enough to be shipped to all the members, but available to add to monthly shipments while supplies last. Members can also order and reorder available rare beers at any other time (not as part of the monthly shipments). Members can custom tailor their beer subscriptions mixing the rare brews with the other four club options of the Microbrewed Beer of the Month Club or with the other monthly clubs. Being craft beer obsessed we spend a significant portion of our discretionary income on specialty beers, whether at breweries or in stores selling limited releases. We like to buy a second bottle of certain aging friendly styles to save for a later date so we can experience the pleasures of how the flavors develop over time. It is not a cheap hobby but it is one we immensely enjoy, while remaining disciplined about how much we spend pursuing it. In short, the cost of our craft beering addictions matters and the relationship between value and cost matters even more. We feel that the value for money proposition of the The Rare Beer Club® is a particularly good one. At the time of this writing, the pricing structure looks something like this. With this exact beer subscription we definitely recommend going for the four monthly bottles if your finances allow it. Let me explain. With four beers shipped a bottle works out to about $18 because the incremental increase in shipping charges is minimal over the base shipping charge associated with the two bottles per month option. (Essentially, the more beer you select to have shipped, the better the deal, duh me). We feel that $18 is more than fair, perhaps leaning towards not-to-miss, for the class of the beers in question and the unique curation process they are a product of. Or the beautiful Zwart Black Star collaboration brew. As soon as we tasted it I wanted to eat blue cheese stuffed figs with it and we didn’t have a single fig at home, so clearly the pairing had to be planned for another time. When you have that extra bottle available doing so is a breeze. And of course, there are the aging choices to consider. The compare and contrast tasting of young and aged beers of a certain style is one of the biggest craft beer pleasures for aficionados and the four beer monthly shipment plan makes it easily achievable at a very acceptable cost. I will conclude by saying that there is a real possibility that you or someone you give this gift to may become happily addicted to a beer subscription to The Rare Beer Club®. If so – congratulations! This post contains affiliate links which help support our blog at no cost to you. We thank the team of Beer of the Month for their continued support of this site. Be sure to check out the Hop Heads Beer of the Month Club, the International Beer of the Month Club as well as their Wine, Cheese, Chocolate and Cigar options. Best a la carte options of any beer subscription plan. They can also request beers (if still available) from past selections in lieu of the current month's featured ones or in addition to them.